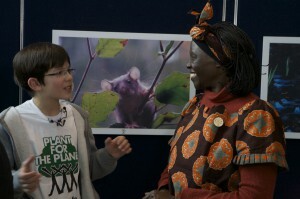 Children from Plant-for-the-Planet launch their campaign to plant one million trees in each country over the next decade. On Wednesday, the United Nations declared 2011 as the International Year of Forests, as part of a campaign to raise awareness of the vital role trees play in sustaining the livelihoods of millions of people around the world. “Civilizations have always been intertwined with trees and forests. We are all familiar with the importance of forests because they are the bedrock of biodiversity and provide so many environmental services. And the call to protect them has been long and consistent,” said Professor Wangari Maathai, 2004 Nobel Laureate, in her opening address to the General Assembly. Although many of the day’s events, from speeches to film clips, celebrated the great beauty of forests, the presentations were sprinkled with reminders of human dependence on trees. Until now, there has been a big emphasis on saving the environment, but the millions of people who depend on forests for their livelihood have been put aside. The theme of the Year, “Forests for the People” highlights the challenges facing many of the world’s forests and the people who depend on them, specifically, sustainable management, conservation and sustainable development of all types of forests. The assembly was also reminded of the strong connection between environmental damage and human poverty. In her speech, Professor Maathai emphasised that sustainability was critical to the realisation of other Millennium Development Goals. During the 1990s the world lost about 36.5 million acres of forest due to deforestation alone, an area larger than the island of Java. This year provides an opportunity to slow the rate of deforestation, some 130,000 square kilometers of mostly tropical forest felled each year. Under the mechanism of REDD+ which was adopted in Cancun in December, the Year of the Forests can help consolidate a joint response to the challenge of climate change, said Juan Manuel Gomez-Robledo Verduzco, Mexico’s Assistant Minister of Foreign Affairs.